Learn how to keep construction workers safe from heat stroke with these preventative measures. Learn how construction workers can detect skin cancer and use prevention tactics to reduce their chances of getting skin cancer via Construction Junkie. F.E. Moran Special Hazard Systems is happy to have worked with the top 10 contractors of 2018 by ENR. Virtual construction technology is being used to reduce change orders, make a safer working environment, and build a better quality building. Learn what technology needs to be included in a successful virtual construction department. F.E. Moran Special Hazard Systems wins TAUC 2017 safety award with a ZERO DART award. Project manager courses available online that will help you increase your salary. Learn how real-time data can increase productivity in the construction industry. TAUC Thomas J. Reynolds Safety Awards Winner! F.E. Moran Special Hazard Systems has won a zero TAUC award for their exceptional construction safety record. Construction Dive wrote an in-depth article about the major challenges that subcontractors deal with on the construction site. Most construction projects use subcontractors for specialty work. Why would a general contractor (GC) self-perform a specialty such as fire protection when they don't have the code knowledge, design experience, or skill set necessary? They hire a subcontractor to complete that work. However, when GC's hire a subcontractor, they are passing along a burden to the subcontractor. Oftentimes, the subcontractor needs to take responsibility for the scheduling of the project and fronting the money needed to complete the project. In some cases, subcontractors need to front millions of dollars for a project and coordinate the scheduling with other subcontractors on the project. 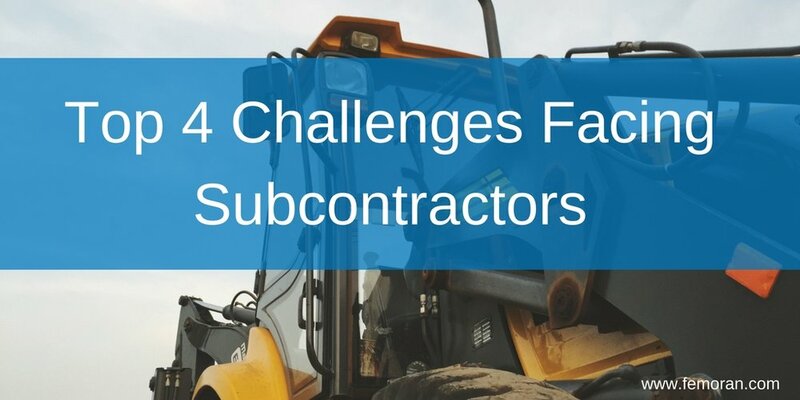 According to Construction Dive, subcontractors have 4 major challenges. GC's often rely on subcontractors to front the money for materials and payroll with a "pay when paid" policy. This puts extra strain on subcontractors, especially those without adequate cash flow. Subcontractors are responsible for coordinating with the other groups on a job site. Working with other subcontractors and coordinating the schedule can be challenging when each contractor's priority is getting their own portion of the job complete. Communication between the owner, GC, and subcontractors is difficult. Each group's main objective is the same. Finish the project perfectly and on time. However, outside factors like labor shortages and scheduling mishaps provide a need for crucial conversations. The labor shortage has been an issue for years now. Contractors are starting to turn jobs down because they don't have a means to adequately staff the job. It is better to not take a job then to take one you can't complete well. The reputation tarnish of a job turned bad is not worth it. In June of 2017, the Big Bend River Station Power Plant in Florida experienced something horrible. It looked like molten lava flowing from a volcano. Fire inspectors determined that five employees were fatally burned when a blockage inside a coal-fired furnace broke, allowing molten slag into the work area. The slag can get to 1,000 degrees. Five employees died from the incident, and a sixth was injured but survived the experience. On June 29, 2017 at 4:30pm. emergency responders were called to Big Ben River Station in Apollo Beach, FL. They were told that workers in unit 2 had suffered severe burns. At the scene, two people were declared dead while four other workers were taken to Tampa General Hospital. Of those employee, three of the four died after being taken to the hospital. In June, a spokesman for the Hillsborough County Fire Rescue said that injuries were "very severe." Among the injured, one was an employee of the power plant - Michael McCort, a senior plant operator who worked for the plant for 35 years. He was pronounced dead at the scene. The other five injured people were contractors. OSHA investigated and recently determined that the plant failed to follow energy control procedures while performing maintenance on equipment. Tampa Electric was cited as was Gaffin Industrial Services, the company that the contractors worked for. Gaffin was cited for failing to provide appropriate personal protective equipment to safeguard employees from burns. The proposed penalties by OSHA total $160,972. "This tragedy demonstrates what can happen when hazards are not properly controlled," said OSHA Atlanta Regional Administrator Kurt Petermeyer. "Employers must develop and implement necessary procedures to prevent incidents such as this from occurring." According to OSHA, 11% of forklifts will be involved in an accident. On average, 85 people die a year in a forklift accident. The Washington State Department of Labor and Industries states that "workers without proper training and knowledge of forklift operation, as well as operators who maneuver forklifts carelessly, have an increased risk of injury or death." Someone who is untrained driving a forklift is just as dangerous as someone who drives a vehicle without a license. OSHA requires that forklift training programs combine formal instruction (lectures, tests, written instruction) with hands on training. Forklift drivers can't just assume that because they have driven a forklift, they can drive any forklift. Different models and sizes drive differently. Forklifts should be inspected before each job. Forklift operators should check seat belts, tires, lights, horn, brakes, backup alarms, and fluid levels as well as the moving and load supporting parts of the forklift. The National Safety Council's training program for rough-terrain lift truck operators says, "Although lift trucks and personal vehicles share some similarities, they ultimately are quite different." Drivers are not enclosed, the weight ranges from 9,000-30,000 pounds, they travel closer to a walking pace, the can tip easier than a vehicle, and they have a tighter turn radius - all making forklifts more difficult to drive than cars. To drive forklifts safely, drivers should have a clear view, look in the direction of travel, use spotters or aides (rear view mirrors), and use headlights. A lift truck has a center of gravity that is higher than in a personal vehicle. However, the load has its own center of gravity. Once the load is picked up, there is a new center of gravity. Lift trucks are built on a three-point suspension, which resembles a triangle. The stability triangle is where the operators need to stay while the truck is in motion. To avoid tipping, operators need to make sure the load is secure and stable, keep loads low to the ground during operation, keep loads uphill while climbing or descending, and drive slowly. OSHA advises that loads are checked before picking them up. The load needs to be stable and the dimensions need to be safe for transport. Read more about forklift safety at Safety + Health Magazine. Asphalt is a very popular pavement material. So popular that researchers are constantly trying to improve it. Recently, they have tested salt-releasing pavement for de-icing, crack healing additives, and asphalt strengthening additives from recycled materials. Most recently, they have tested adding cigarette butts. Adding cigarette butts to asphalt is multi-beneficial. One, it reduces landfill waste; and two, it reduces the heat island effect of pavement. Researchers encased the cigarette butts in paraffin wax. The urban heat island (UHI) effect is when it is hotter in an urban area, partially due to the dark asphalt adsorbing solar radiation. UHIs reduce rainfall, decreases air quality, and decreases water quality. The need for reduced temperature of asphalt became news recently when L.A. decided to paint their asphalt a lighter color to reduce the heat. 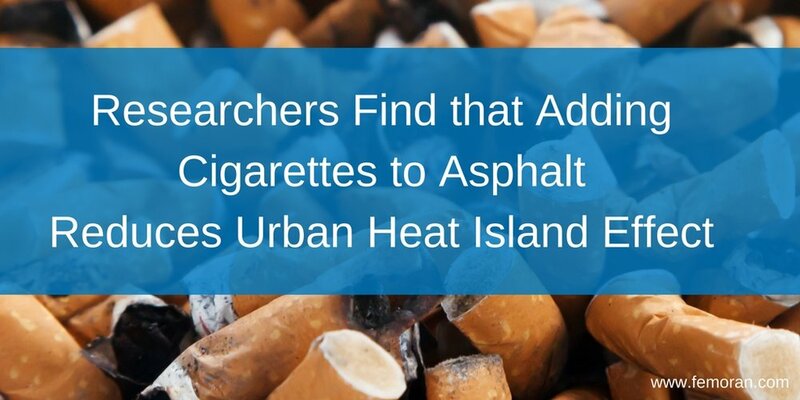 By adding cigarette butts to the asphalt, it would reduce the bulk density and increase the porosity of the bitumen, reducing the asphalt temperature. Lansing Community College noted that 4.3 trillion cigarette butts are littered annually, of that number, 80% get to waterways. This causes pollution in drinking water and hurts wildlife. What construction material would you like improved? Let us know in the comments. Toolbox talks are important, but they can get repetitive or boring if you aren’t making an effort to spice them up. Here are four tips to make toolbox talks more interesting and engaging. Just like any public speaking, you want to draw your audience in. One way to do that is to make it fun. You can run a contest to increase participation, make the toolbox talk into a game, and keep interesting through real life examples. Toolbox talks are a great time to build a community with your workers. Invite them to share experiences related to the topic. Give other workers the opportunity to lead a toolbox talk with your guidance. To build a community, we go straight into number three, have a common goal. To build a community within your team, have a common goal you can work on together. Maybe your goal is to reduce your EMR. At the end of each meeting, wrap up with something you can do that week to accomplish the goal. If you reach your goal, decide on an incentive like a company-paid happy hour or catered lunch. Attract the attention of all learning types. Use elements of visual, audio, and hands-on to keep your team’s attention. As an example, a visual learner might respond to images or video best. An audio learner might enjoy a verbal presentation, podcast recommendations, or a video. A hands-on learner would learn best by physically doing part of what your toolbox talk is about. Adding in stories of real life experiences will keep people intrigued and will bring more perspective to the toolbox talk. Keep your workers’ attention by adding some extra interest into toolbox talks. They will no longer be something people have to do, but rather, something they look forward to. Pre-task planning is essential for the timely and safe completion of a task within a construction project. A pre-task work plan covers six essential aspects of the task to be performed: determining potential problems, scheduling, costs, quality requirements and assurances, prerequisite tasks, and determining the progress of the task. Follow the directions below to arrange your next pre-task planning meeting. 1. Compile a work plan that addresses the six angles of task planning. 2. Review the work plan with the crew. 3. Discuss the work that needs to be done to complete the task. 4. Assign jobs to the crew that will aid in completing the task. 5. Begin the discussion on safety hazards. 7. Determine if modifying the work plan will avoid the hazard by rearranging the sequence of events or using different tools. 8. For hazards that cannot be eliminated by modifying the work plan, introduce safeguards against the hazard. Put safety and timely completion of a project first by implementing these eight simple steps into your next pre-task planning meeting.